In 272 pages, with photos and drawings (including design and construction details) Haig Beck and Jackie Cooper show 30 environmentally sustainable buildings spanning 35 years of the practice of one of Australia’s foremost architects, Clare Design. The Clares, practising as architects on the far side of the world, approach their work with a philosophical position that produced beautiful, climatically responsive, low-impact, environmentally sensitive buildings. They achieved this working not from a body of widely accepted theory and practice but from first principles, applying native can-do empiricism to their designs. These buildings – made in partnership with clients – are demonstrations of this architectural philosophy. Almost from the inception of their practice, their work was recognised and commended by their peers with architectural awards. Over the years their elegant and climatically sensitive buildings have been the subject of exhibitions, magazine articles, both popular and professional, and several books. Lindsay and Kerry Clare. 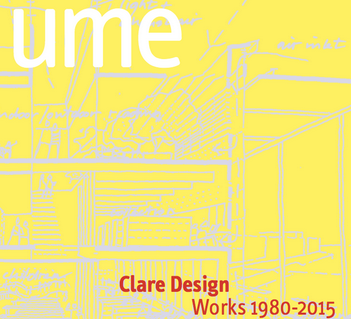 Clare Design was established in 1979 on the Sunshine Coast in Queensland. Lindsay + Kerry Clare, a husband and wife team, have been producing architectural projects for more 35 years. Their work has been consistently acknowledged at home and internationally, for design excellence and environmental performance. Haig Beck + Jackie Cooper write, “The Clares’ ideas about experiencing natural light and ventilation are merged with their ideas about typology. They fuse ideas about type and climate into building form. Their buildings allow occupants to engage with architecture and the world outside, reinforcing the essential connection with place.” They received the RAIA Gold Medal in 2010. Haig Beck and Jackie Cooper. In 1976 Haig Beck was appointed editor of Architectural Design magazine. In 1979 he and Jackie Cooper launched International Architect magazine in London. They returned to Australia in 1986 and have continued collaborating as architectural editors, critics, writers and publishers. In 1996 they launched UME magazine. The output of 40 years of writing includes books, chapters, articles and critical reviews. Most of these have been jointly written.